Includes bottled water and water tight bag! Your search has officially ended at the best, most unique, and fun jet ski tour Fort Lauderdale has to offer! You might be wondering why Jet Ski FL would be the right company to choose for this activity, and the bottom line is…WE CARE ABOUT YOU! 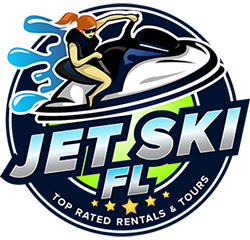 Everything we do at Jet Ski FL is to make sure that we far exceed your expectations of just a typical jet ski tour of Fort Lauderdale. Our attention to detail is what our company is based on. Simple things such as providing water and phone cases, or taking amazing pictures of you to leave with, or making a lifelong friend with your tour guide. These qualities along with safety preparation is what makes us who we are. It can be scary for some getting in the water on a high performance vehicle if you don’t have experience. What we do is prepare you, work with you hand in hand, and coach you during your entire jet ski adventure. For just an extra 20% gratuity, your tour guide will lead you through the dreamy yacht & mansion loaded waterways (which to some can be a little confusing), explain about the area & the history, explain the speed zones and channels, and take 5 star photos for you to leave with. He will also point on the best restaurants and tips around town as well as be there incase of an emergency. If by chance your jet ski intake gets clogged with seaweed, he will be there to unclog. On a very rare occasion that your jet ski stops running, your tour guide will be right there to help tow it back. Many people have worried about jet skis capsizing in the waterways or ocean. There is not much concern here as we have the most stable and sturdy jet skis on the market containing specifically Yamaha VX cruisers, a triple seater vessel with only the best ratings and feedback. Above are your jet ski tours Fort Lauderdale prices and options. We were built for the sole purpose of eliminating bad service in the jet ski rental Fort Lauderdale industry. At Jet Ski FL, expect the best, receive nothing less. Call (954) 383-8724 to book now!